Welcoming a new life into the world is a treasured time, and planning a baby shower for a mom-to-be is a special honor. Impress guests with your planning skills by referring to this checklist to organize a baby shower they won’t soon forget. Coordinate with the Guest of Honor - Check in with the mom-to-be and decide on a baby shower date. Give her enough time to contact key family members who may need to make travel arrangements. Decide Your Vibe - Discuss the type of shower your guest of honor prefers. A more formal event with only ladies present? A co-ed casual shower? Is this a work event? Can the gathering include children? Consider a “Sprinkle” - This version of the traditional baby shower is perfect for moms with other children who want a smaller event. Gifts will probably focus more on pampering presents for mom or baby basics like diapers and wipes. Pick a Venue - If hosting somewhere other than someone’s home, call the preferred restaurant or venue as soon as possible to check for availability. Think about a place you can easily stack presents if you plan to open them during the shower. Pick a Shower Theme - Make sure there’s time to order any items that need customization or extra delivery time to arrive. Ask the mom-to-be if she has any preferences on colors or gender-specific ideas. Create an Invite List - You’ll almost certainly need to get this from your guest of honor. Ask her to include email addresses for an online invitation or mailing addresses if you’re going a more formal route. Recruit Extra Help - Grandmothers-to-be and good friends are more than likely happy to pitch in. Assign people different tasks based on their interests such as selecting baby shower games, decorating and coordinating food orders. Genius Tip: Create an online sign up so duties are clear. Create a Website - If you’re really going all out, create a mini website for the mom-to-be that includes pregnancy photos, special stories about her experience, nursery themes/inspiration, registry details and more. Finalize the Registry - Depending on your guest of honor’s personality type, offer assistance in completing baby wish lists. Either way, make sure she’s got everything on the registry before invites go out to guests. 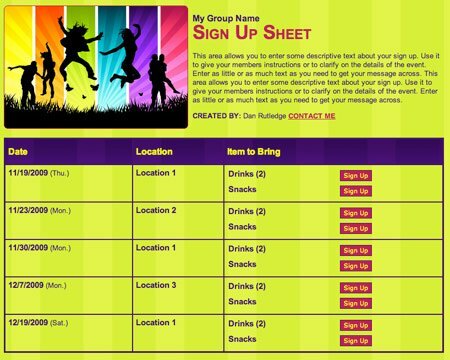 Send Invitations - Make it easy to track RSVPs (and who’s bringing what food) by creating an online sign up. Guests can easily edit their responses if anything changes. Plan the Menu - Consider an afternoon tea, lunch or even an indulgent spread of desserts. Confirm any orders that will involve caterers or bakers. If you’re doing most of the cooking, create a grocery list to buy the week of the party. Decide on a Fun Punch - It’s the perfect occasion for fizzy, colorful refreshments. Explore numerous ways to tie in themes here, such as floating rubber duckies in blue punch or placing mini plastic sailboats on top. Order Sweets - Select the cake — or cupcakes. Ask your guest of honor about her favorite flavors! Plan Baby Shower Games - From the classic mommy tummy measurement to the hilarious spit the binky contest, don’t miss this chance for rolling laughter and excellent photo ops. (Though you should check with the mom-to-be in case she’s not into games.) Genius Tip: Use these 25 baby shower games for inspiration. Coordinate Photography - If you want to hire a professional photographer, start looking even sooner. However, enlisting a friend who will be in attendance should work just as well for this occasion. The most important thing is to be intentional about capturing memories during this special event. Create a unique hashtag for your baby shower if you want friends to be able to easily upload and share their own photos. Buy Paper Goods and Decorations - It’s great when some of the decorative items can be useful afterward, such as baby bottles, diaper pails and baskets. Prepare Party Favors and Prizes - Consider items that can double as decorations such as flower bud vases used as centerpieces or mason jars filled with colorful jellybeans and tied with frilly ribbons. Refine Your Shopping List - Gather as many nonperishable items as you can — it will make the final days feel like a breeze. Coordinate a Decorative Table - Include baby photos of the new mom and dad. If available from their parents, include special items such as old favorite toys and baby outfits. Double Check Reservations - If you’re hosting at a restaurant or other venue, double check and reconfirm all reservations and menus. You should also have a better idea of your final guest count at this point. Purchase Gifts for Guest of Honor - Don’t wait any later to buy presents for the shower to build in shipping times. Consider a group gift for larger items like strollers, car seats and pack-and-plays. Honor the Mom-to-Be - Order a corsage, special sash or tiara for the guest of honor. If her mother and mother-in-law are attending, it’s great to order them something special as well. Purchase a Memory Book - Ask guests to fill pages with their best baby advice. Review the RSVP List - Finalize the number of guests confirmed. If anyone has not responded yet, call or text to check. Finish Shopping - Complete purchases of all food items and decorations. Get your perishable items organized in your fridge for the party. Decorate a Special Chair - Designate a place for the guest of honor to sit while opening presents. Include some extra pillows for comfort along with something to prop up her feet. Prepare a Gift Table - Make sure there’s also a special basket for gift cards. Confirm Helpers - Check with everyone who has offered to help on the day of the shower, confirming arrival times and any food items they’re bringing. Decorate the Party Space - Gather all party favors and prizes the night and set up any decorations you can if the party is being held at someone’s home. Set Up the Food Station - Make sure you have all serving utensils ready, including items such as cake servers, knives, platters, serving bowls and spoons. Prep Food - Cook any dips, sandwiches or casseroles you can the night before and refrigerate and reheat the next day. Complete any last-minute grocery stops (make sure extra ice is on the list). Set Up Extra Chairs - If the mom-to-be will be opening gifts, you’ll want plenty of comfortable places where guests can watch and ooh and aah. Pack the Car - Include all nonperishables and decorations if you will be going to another venue. Pick Up the Cake - If the bakery is very close, you may be able to pick the cake up the morning of the baby shower, but you probably won’t want to risk it. Don’t forget any balloons, flowers or other items that have to be as fresh as possible. Arrange Food and Drinks - Organize your food and drink setup with a smile and sigh of relief that it’s all ready. Write Down All Gifts and Givers - Assign a helper who’s sitting near the mom-to-be for this important task. If you really want to help her out, have guests write their addresses down on envelopes as a party station so she’ll have less to fill out for thank-you notes. Make Sure the Mom-to-Be Eats - Talking baby details with all of her friends can take a lot of time, so make sure someone prepares her a plate and takes photos so she can enjoy her special day. Stay on Schedule - From party games to present opening, keep things rolling so the baby shower ends on time. Thank Guests - It is always a good idea to give acknowledgments to special loved ones and friends who will be loving on the new baby. Pack Up - Help the guest of honor fit everything in her car for the drive home! Have someone help her transport anything large that won’t fit in her vehicle. Now that you’ve got this helpful baby shower guide, planning your special party will be easy. Just get ready to coo over all those sweet baby clothes. 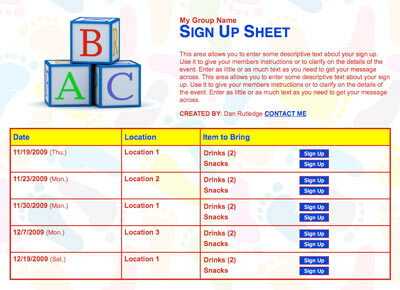 Collect money for a group baby shower gift with a sign up.